I Malinguna Påtgon (The Lost Child) tells the story of a young girl named Bella, who feels like she has been forgotten by her large and very busy family. She finds friendship and love in her garden. 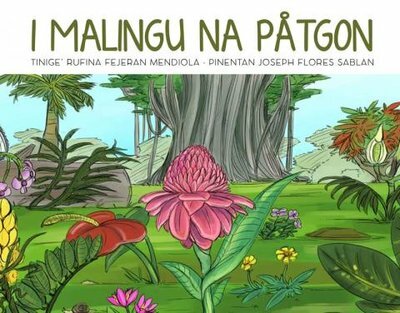 Through captivating illustrations, I Malinguna Påtgon depicts key CHamoru values, particularly the importance of family and working together. Ma Guaiya Yu’, si Nåna yan si Tåta (Grandma and Grandpa Love Me) is a vibrant picture book featuring lovely watercolor illustrations that depict the many ways grandparents show their love to their grandchildren. From holding hands in church to going on hikes in the jungle, this story describes the important role grandparents play in the lives of ifamagu’on-ta, our children. StoryBoard 17 A Journal of Pacific Imagery.